In an era of structured education and standardized testing, this generational difference might not yet be evident. But the gamers' mindset - the fact that they are learning in a totally new way - means they'll treat the world as a place for creation, not consumption. This is the true impact videogames will have on our culture. In essence, games are really about learning to solve problems. In this way, games have always been about learning; the difficulty is that exactly what is being learned varies greatly between games. Few would dispute that play functions as a wonderful learning tool for infants and young children when they are first learning skills such as motor coordination and spatial movement. The difficulty is when adolescents and adults continue to play games where they are still simply pushing their motor coordination and spatial skills to new extremes, rather than learning new skills. Interspliced with the motor coordination problems are traditional drill assignments that a player must complete before returning to the game or watching a new animation. As discussed with Story-Games and Edutainment, this strategy results in an experience that essentially combines the entertainment value of a bad lecture and the educational value of a bad game -- and can only be sustained commercially today if we rely on parents or teachers to force kids to endure it. Rather than seeing "edu" as being distinct from "tainment", we need to understand the circumstances in which human beings actually enjoy learning to solve problems, and then find ways to present the player with problems that draw upon the skills we consider important. The above game, The Zoombinis Logical Journey, does not resemble mathematics education as it has developed over the years in many elementary textbooks. Arguably, we could say it is not as educational as a game such as Math Blasters. Yet, if we look closely at the ways in which shapes and colors are combined to plot different graph positions on the wall, the essence of the game is clearly to learn mathematical thinking in order to solve logical problems. As the game designers remark, "in effect we found the 'game in the math' rather than putting math in a game." For most educational disciplines, the challenge now is to identify possible game activities that draw upon the relevant abstract concepts for their discipline. Math educators might explore how various concepts could be applied to a cryptography mission in a game. History educators are refining the use of role play in understanding individual contributions to history. Science educators show how simulation and modeling can be used to visualize multivariate emergent data. In some cases, this represents a paradigm shift in the way these disciplines deliver many of their concepts. For language educators using a communicative approach, structuring lessons around activities that require participants to develop communicative abilities in order to complete tasks is hardly anything new. We now need to connect those tasks into meaningful game frameworks. We are fortunate that the underlying problem in many video games, social coordination, is already a direct match with our own primary pedagogical goal. As it turns out, game designers are finding that many of the best games activities are the same ones already central in foreign language curricula. Situation 7. 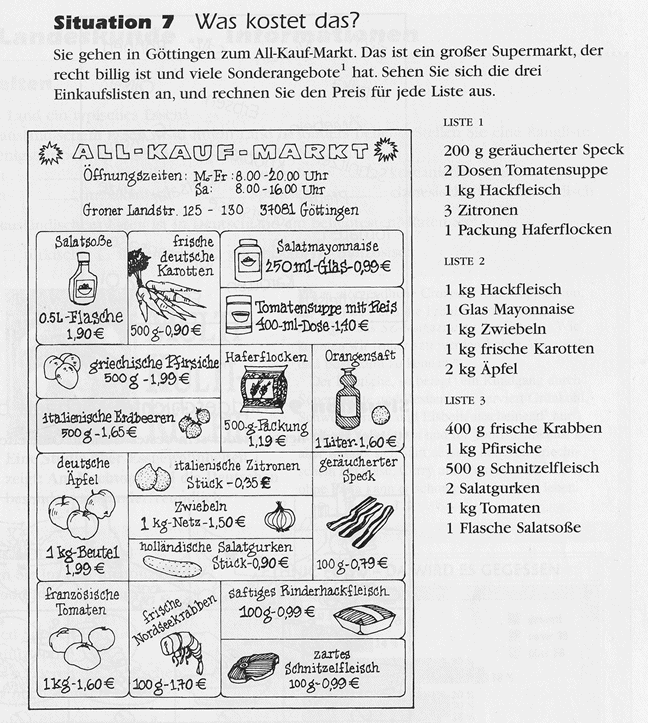 Calculate the price for each of the shopping lists on the right from the provided supermarket flyer. 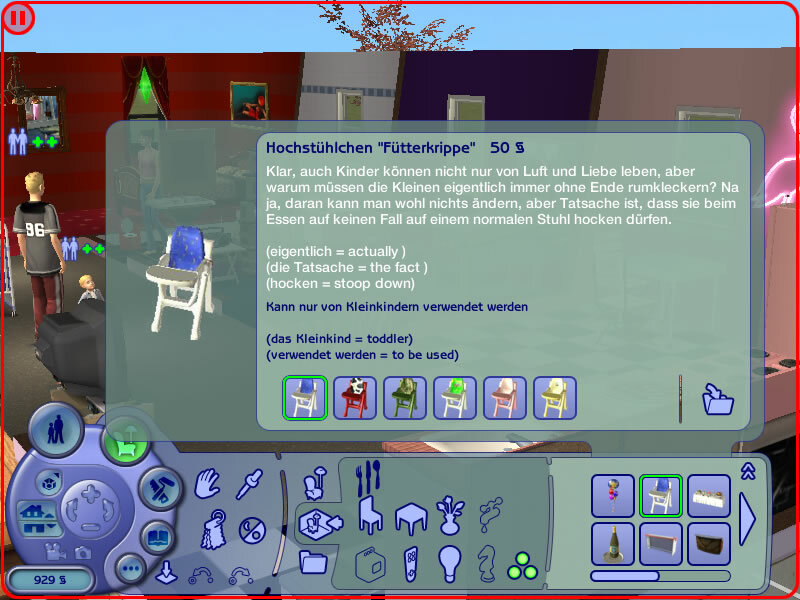 A player in The Sims 2 analyzes a shopping catalog of baby-items to determine which chair best matches the needs and budgets of a particular family. While many entertainment games today could directly support many of the activities and goals foreign language educators are building into their classrooms, often the computer games prescribed for homework do not. 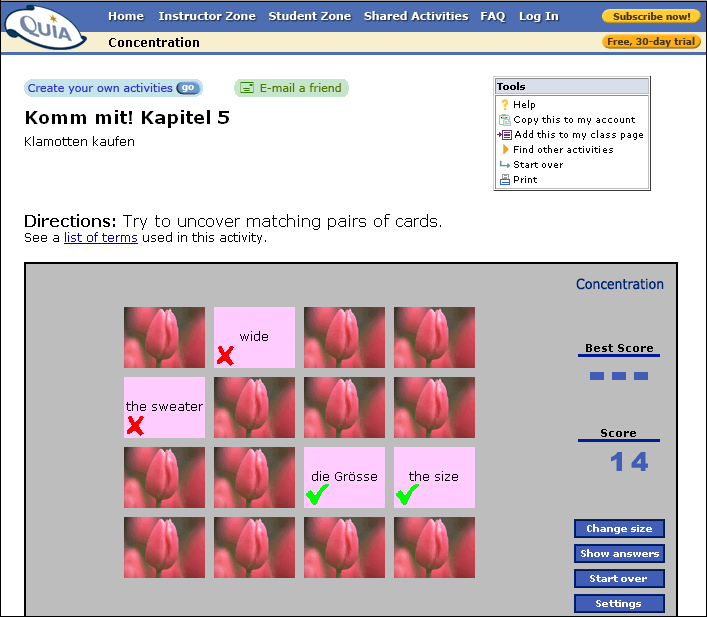 If we look at the quia.com activities included in with many textbooks, the game activities unfortunately share no connection to the meaning of any of the language used. Tests of linguistic competence are often entirely abstract. Students may be asked to transform sentences which are completely out of context and have no real referent. For example, "Change the following sentence to the past tense: John goes to the store. Who is John? What store? When? Why?To complete such a task, we must think about language not as a tool for the communication of ideas, but as an abstract entity which can be manipulated by following certain rules. While an underlying game activity such as matching could be useful for learning tasks such as comparison, using it for all language content unfortunately reduces a word to being merely an arrangement of individual letters.